It's not going to crash here, but it's still exciting! 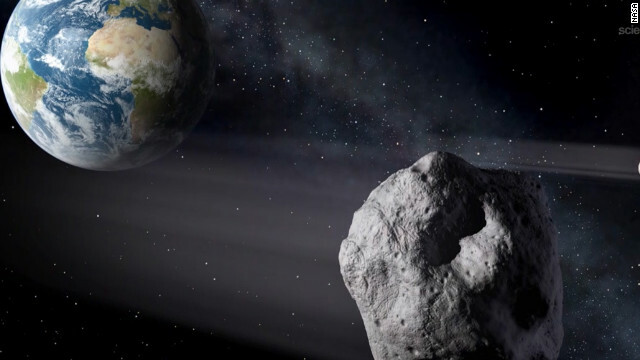 An asteroid made its closest pass by Earth at around 2:24 p.m. ET, flying about 17,200 miles above Earth’s surface. It’s estimated to be about 150 feet (45 meters) across with an estimated mass of 130,000 metric tons. The flyby was the closest ever predicted for an object this large, according to NASA. The asteroid, called 2012 DA14, flew between Earth and the satellites that ring the planet 22,200 miles up. Scientists think there may be 500,000 asteroids the size of 2012 DA14, but fewer than 1% have been located. NASA says the asteroid is entirely unrelated to the meteor that exploded over Russia Friday. Check back for live updates beginning at 2 p.m.
2:27 p.m. NASA's Jet Propulsion Laboratory will continue to stream images at http://www.ustream.tv/nasajpl2. More information is available at http://www.nasa.gov/asteroidflyby. 2:25 p.m. We survived! The asteroid has passed its closest approach, and is now heading away from Earth. 2:24 p.m. Paul Chodas is back. He says the orbit will shrink a little. It could make a close approach again in the year 2046. We can predict its path through most of the 21st century, he says. 2:20 p.m. Lance Benner from NASA's Jet Propulsion Laboratory talks about the Goldstone Solar System Radar, which is useful in measuring the size, shape, rotation state. Scientists want to better understand its motion. The asteroid appears to rotate about once every six hours, he says. "It's conceivable that it could be somewhat larger or smaller" than the estimate of 150 feet. He'll be heading out in about an hour to get more data about this space rock. 2:14 p.m. A visualization tool called Eyes on the Solar System uses data on DA14 to track the asteroid in real time. You can visit this website to look around the entire solar system in an interactive way, including the asteroid. 2:10 p.m. Talking about the Russian meteor: The two events are unrelated. "It's simply a coincidence" that they happened to come near the Earth on the same day. An amateur group in Spain spotted the 2012 DA14 asteroid. NASA-funded surveys have found 95% of near-Earth objects. The Gingin observatory is observing the streaking of the asteroid. It's amazing how bright the asteroid is on its approach, says Paul Chodas of the Near Earth Object team. The reason it streaks: It moves during the time exposure of the telescope, he says. Auriol Heary at the Gingin Observatory in Australia says there are very clear skies. "The Milky Way is so clear you can almost touch it." 2:04 p.m. If you're in Eastern Europe, Asia or Australia, you could see this object with binoculars or a telescope, says NASA's Don Yeomans, who gave CNN a Science Seat interview this week. 2 p.m. NASA says we know the closest approach of this asteroid will be about 2:25 p.m., but "closest approach" takes hours. From that point on, it will be flying away from the planet. NASA is showing images, both from hobbyists in Australia. The Gingin Observatory, near the town of Perth, Australia, on the Western side, is capturing a great view of the asteroid moving. This might look cool but it is not. DA2012 is 50 yards wide and 130 thousand metric tons. The meteor that hit Sibiera was smaller with a weight of 7 tons. we need to spend more money on space exploration. if anything large ever hits us,it may be the end of us all. If it was to hit us......we would have never been told. Ah, the arrogance of Christians. Thinking that it's only possible for their religion to exist. NASA story was wrong, can we trust NASA story next time ?. As the men with "Big Brains" have determined: absolute velocity and absolute position are nonsensical terms. I suspect that the very tiny asteroid beings must have been really scared when the earth came flying by so fast with all those appliances sitting around in the nearby space, and now they are faced with zooming into the giant lBBQ. We should all have compassion for the tiny beings that inhabit asteroids. Some day, all life will go extinct, said a "Big Brain." I feel compelled to add my sarcasm to those who adjudicate themselves professed in the science of extemporaneous hyperbole. It worked for me when I ran my lab, and now I am running a wheelchair. What do I know? I am just a particle. We have been pelted like this or more for a very long time, like many millions of years. We are just now getting smart enough to realize what is going on, I think, maybe, Hope so etc. I will say "Ni" to you! Prepare for your doom! Its prophecy, you know where it says there will be signs in the heavens, one for GOD, Zero for science. I don't think that's quite exactly what it says. Besides, if it weren't for science, you wouldn't even know the asteroid was there. Yes. First chapters of genesis state the stars and what is in heaven is for signs and seasons. Amazing that human science could be tracking an asteroid, yet be shocked by an unknown, unrelated meteorite instead. Goes to show God is in control of everything. Science included. for "Hi" et al. their post was: science is the root of all the world. think how much we wouldn't know without it. Surely true, But it is Science that is helping us to understand God and all his creations. I love learning about both Science and God since they go Hand in Hand and cannot be separated. Quite an interesting day. Hope we can get better explanations because we are still not to cleared. Any chance of latching a shuttle on to one of these massive asteroids and getting a free ride to say, Mars? Is you "Caps lock" key stuck in the "shout" position? But....I just drank a funny tasting cool-aid after my church pastor told me to duck? You mean, we aren't all going to be judged today? Oh...feeling sleepy now. I'll chat more when I wake up....zzzzzzzz. Tunguska in 1908 and another big one in 2013. Hmm. That country can't catch a break. 2 big meteorites in 100 years is kind of a long shot. And this all happened on Obama's watch??? ...............just kidding people!! An asteroid?! Ain't nobody got time for dat! Wow...I felt the wind go through my thinning hair! I lost internet connection for a couple of minutes right as it passed by. I suspect it may have interfered with a communication satellite. The universe should keep it's crap to itself. That would include human beings. So... what are you, a goat? Thanks to the NRA for deflecting this meteor with all their guns! I was hoping for a little gravitational pull, or something. When do the Zombies wake up??????????????? God was planning to destroy the earth with this asteroid but I prayed for Him to spare us. He did. Obviously prayer works. Thank you obomma for waiving your hand and deflecting this away from our planet–ALL HAIL OBAMMA!! Already? What happened to missing the earth by 15 minutes tonight that all the news reports were talking about? Doesn't lend confidence that they knew what they were talking about. The time refers to the approximate distance from Earth (the time, in its speed, that it would be away from Earth). It would be about 15 minutes away from Earth, as in it would take 15 minutes from its closest position to enter or strike the planet. That is well within the orbit of the Moon, as well as within geosynchronous orbit of many satellites. EXTREMELY close. Happening now. You have to be on the night-side of Earth to be able to have a chance to sight and track it (going very, very fast)-but still viewable. About the brightness of a dim star. But they ARE wrong about a great many things-and are constantly surprised by what's discovered. Not to mention often far too confident in their estimations. They've been 'surprised' countless times over the last several years. Aloha- means hello and goodbye. How could it not have landed in Washington D.C? That city needs to be wiped off the face of the earth. WIll it be visible tonight in the United States? WIll there be an asteroid trail? WIll the Cubs ever WIN? These questions, and many others, will be answered on the next episode of...."Soap"! I think the answers to all of these questions is no. I am saddened by the last one, as I am a Cubs fan myself. Please hit the middle east and then the white house. Thank you. Its all in the news. That meteor that fall in Russia is part of the debris flying close to this asteriod. Except that it was travelling in the opposite direction, and not of enough mass to hold smaller pieces in it's orbit. "2:24 p.m. Paul Chodus is back. He says the orbit will shrink a little. It could make a close approach again in the year 2046. We can predict its path through most of the 21st century, he says." Really? You can tell what effects all the other rocks, planets and suns are going to have on this rock over the next 87 years? I really doubt it and plan to be here to prove it. I think that is true only in the case of small meteorites... those that are only a few meters wide.. if it is big enough to cause an impact damage, we would be able to see it.. as with da14.. its only 50meters wide and we were able to track it for the last few weeks.. This is your only warning! I kept my asteroid from striking your miserable planet this time, but I want $20 gazillion and good seats for the next Super Bowl or I'll drop it on London! And your foolish Mr Bond is trapped in a cage over a pit Boone's Farm wine and will soon suffer a disgraceful ending! BWAAA-HAA-HAAAAAA! Well, not exactly... Even if they were right and the asteroid did hit earth, by the size estimates its maximum damage would encompass a city's destruction. A far cry from the total planetary destruction/doom (purportedly) predicted by the Mayan calendar's end. There was no doomsday event predicted according to the Maya, just a new age. This has nothing to do with climate change. Close? Nothing happened. What do you mean exactly? CNN... Unbelievable. I just spent hours waiting for this event on your station. Why would you cut away from this live event to talk about a murder and air commercials? Your program director is an idiot. Idiot? LOL! Pot, meet kettle. If they could see this one. How come they didn't see the one in Russia this morning? Repent, the kingdom of God is near!! Asteroid came, asteroid saw and the asteroid went with the promise of coming back again. Someone at CNN please ask, will passing close by one of our satellites throw it out of its own orbit? Maybe if the rocket scientists at Nasa would spend less time getting arrested in DC and swapping spit with Daryl Hannah, they would know when this space junk is coming down and provide some type of warning! OWWW, that burned, but I caught it in my old catchers mit. Anyone want to see it? Not to worry, North Korea has everyone covered. If it won't hit Earth, how come President Obama has left WH and been escorted to a secret location? Can we put Obama and Biden on and fly them away??????? Stick to raising cattle, political jokes aren't your strong suit in the least. Sure...and can we include you everyone from your welfare state as well? "I don't wanna close my eyes....I don't wanna fall asleep, cuz I'd miss you baby, and I don't wanna miss a thiiiing!" the impact crator is causing all the earth her to open up...many people and some small household animals are falling in! The trees are all on fire and the smoke is blinding! And walmart says they will stay open. Will i be able to see if in New york? help us I am burning alive here...the whole town is gone! So, when is Captain Kirk and Spock going to go inside the obelisk and fire the tractor beam? Is it possible that the asteroid has smaller bodies orbiting around it? therefor explaining why the meteor over Russia came in from a different direction? Is that you Mr. Jingleheimerchmidt? no one can predict what god is capable of doing. Kitty you apparently didn't pray enough. Why do people have to bring a God into this? No God did this, and Asteroid just so happen to pass by. Oh my god it just hit here!! there are bodies everywhere and the trees are all on fire...I can barly breath with all the smoke. Such drivel, grow up and quit believing in fairy tales. Yes, it IS exciting! I still feel bad for those who were injured in Russia today. How horrifying! WHY didn't anyone predict that one?!??? Yes, why? I mean I can not think of one logical reason that no one predicited that meteor hitting Russia.